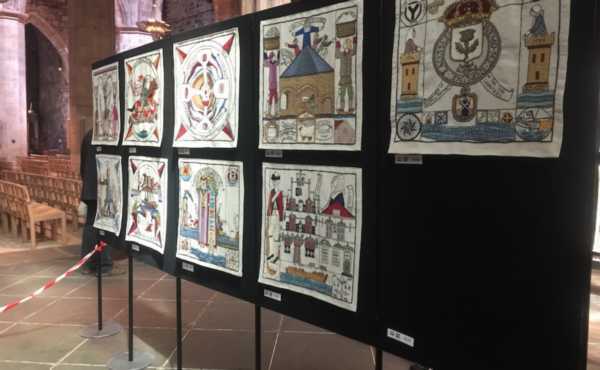 "On Sunday afternoon an individual removed panel NL05 from the exhibition at St Giles' Cathedral, where we are celebrating the Tapestry's safe return from its world tour. We are dismayed and disappointed that one of our panels has been taken so brazenly, in broad daylight and while on public display. Every panel in the tapestry is an individual work of art, representing on average 300 hours of stitching by committed volunteers around the world. While in itself the missing panel is beyond price, its real value is as a vital part of the whole international community artwork. We hope very much that we will see it recovered to take its rightful place for many thousands of people to enjoy as our ongoing exhibition programme continues throughout Scotland and beyond. We therefore appeal to the person who took the panel to return it to us, and for anyone who may have information to contact Police Scotland as soon as possible." Police Scotland have issued the following description of a suspect they wish to identify: white, 6ft tall with a slim build, a receding hairline with short cropped hair at the sides and a fair complexion. He was wearing a long-sleeved white top, light-coloured trousers and was carrying a jacket. Anyone with information has been asked to contact Gayfield CID via 101 and quote incident number 2639 of May 7. Reports can me made anonymously through the charity Crimestoppers on 0800 555 111.